Geneva/Stuttgart. The heartbeat of a new generation: at the centre of Mercedes-Benz's presence at the Geneva Motor Show (8 to 18 March 2012) will be the world premiere of the new A-Class. The company is opening up a whole new chapter in the compact segment: markedly emotive in design, with powerful engines ranging from 80 kW (109 hp) to 155 kW (211 hp), and extremely efficient, with emissions from just 99 g/CO2/km. At the same time the new model underlines that for Mercedes-Benz safety is not a question of price - the standard specification includes, amongst other things, the radar-based COLLISION PREVENTION ASSIST system. Design and dynamism are obvious characteristics of the new A-Class even at first glance, simply in the way it sits up to 18 centimetres closer to the road than its predecessor. The radical new design idiom that was so enthusiastically received upon its first appearance with the "Concept A-CLASS" has been rigorously applied for the series-production model. With their fresh interpretation of the classic two-box design, the Mercedes designers have created an emotive exterior with a pronounced sporty flair. "Applying the new dynamic style of Mercedes-Benz to the compact class was a challenge that we thoroughly enjoyed", explains Gorden Wagener, Head of Design at Mercedes-Benz. "The almost sculptural lines of the A-Class are very typical for Mercedes. The feature lines, particularly along the sides of the car, then give the A-Class structure and tautness." The objective when it came to the interior design was to complement the sporty look of the exterior. On top of this the car has a high-quality feel about it that is unique in this segment, achieved both through the design idiom as such and through the choice and combinations of the high-quality materials used. As seen in the Concept A-CLASS, there is an option allowing a smartphone to be fully integrated into the operating and display system. A special app makes it possible to use the full functionality of the iPhone® , and in due course also of other smartphones, in the car. All trim surfaces feature an electroplated finish in "silver chrome", giving them a genuine metallic surface with "cool touch" effect. "This is just one example of the way in which the quality of the A-Class's interior is not defined by classic trim elements but by consistent design and by the specific materials used", explains Hartmut Sinkwitz, Head of Interior Design. "The motto we used when designing the interior was 'pure sportiness, newly interpreted'." Particular visual highlights include, for example, the air vents, which stand out like "sparkling jewels" (Sinkwitz), so underlining the exceptional quality of the interior. The sporty character of the vehicle is further emphasised by the integral seats (optional extra) in the front. The rear seat is similarly sporty in appearance and can accommodate up to three passengers. As well as the basic specification, which can be individualised with a wide range of options, there is a choice of design and equipment lines that have been put together with the requirements of customers in mind: "Urban", "Style" and "AMG Sport". 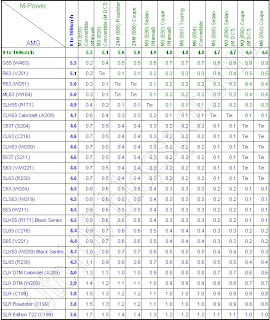 The world premiere of the new A-Class (length/width/height: 4292/1780/ 1433 millimetres) will take place at the Geneva Motor Show (8 to 18 March 2012). It will be making its way to European dealers in September 2012. For the first time, the performance specialists from AMG were involved in the development of the compact class from a very early stage. The result is the most dynamic version of the new model series - the A-Class Sport 'engineered by AMG', in which the visual affinity to the Concept A-CLASS is at its most evident - particularly in terms of the new diamond grille. The A-Class Sport features exclusive 18-inch AMG light-alloy wheels in a 5-spoke design with 235/40 R18 tyres all round and painted high-gloss black with a high-sheen finish, together with red-painted brake callipers. These give an indication of the particularly dynamic driving qualities of the A 250 Sport and the A 220 CDI Sport, which are differentiated, amongst other factors, by a special AMG-developed front axle and a suspension that has been configured to match. The diesel engines also offer an impressively high level of efficiency and environmental compatibility, thanks to sophisticated injection technology and turbocharging. The A 180 CDI offers an output of 80 kW (109 hp) and a maximum torque of up to 250 Nm, while the A 200 CDI has a maximum output of 100 kW (136 hp) and torque that rises to 300 Nm. The A 220 CDI has a displacement of 2.2 litres, an output of 125 kW (170 hp) and torque of 350 Nm, delivering absolutely exceptional performance in the A-Class. Its exceptional aerodynamic performance, with a new record Cd value of 0.26, puts the A-Class at the top of its class. This is further helped by the standard roof spoiler, which hides all the unsightly aerials on the A-Class. The A-Class is the only vehicle in its class to feature as standard a radar-based collision warning system with adaptive Brake Assist, which lowers the risk of rear-end collisions. The COLLISION PREVENTION ASSIST system gives a visual and acoustic warning to alert a possibly distracted driver to identified obstacles, and prepares Brake Assist for the most precise braking response possible. This is initiated as soon as the driver steps firmly on the brake pedal. The PRE-SAFE® preventive occupant protection system is now available for the first time in the A-Class. This innovation, which was premiered in the S-Class in 2002, thus makes its very first appearance in the compact class. Core features of PRE-SAFE® are reversible belt tensioning, the closing of side windows and sliding sunroof in case of critical lateral dynamics and adjustment of the fully electric front passenger seat with memory function to an ideal position for maximum effectiveness of the restraint systems. PRE-SAFE® is always activated in response to critical longitudinal and lateral dynamics and may also be triggered upon intervention by certain assistance functions. "A is for Attack: the A-Class is a clear statement of the new dynamism of the Mercedes-Benz brand. The A-Class is completely new, down to the last detail. In automotive development, it's not often you get the chance to start with a clean sheet of paper. Our engineers and designers have made the very most of that opportunity." Dr Dieter Zetsche, Chairman of the Board of Management of Daimler AG and Head of Mercedes-Benz Cars. "A new Mercedes must take the lead, in technical terms, in every class of vehicle. Whether we're talking about efficiency, driving dynamics or safety: the new A-Class raises the benchmark significantly. Pure driving enjoyment, plus exemplary efficiency – from a technical perspective that is the quintessence of the A-Class." 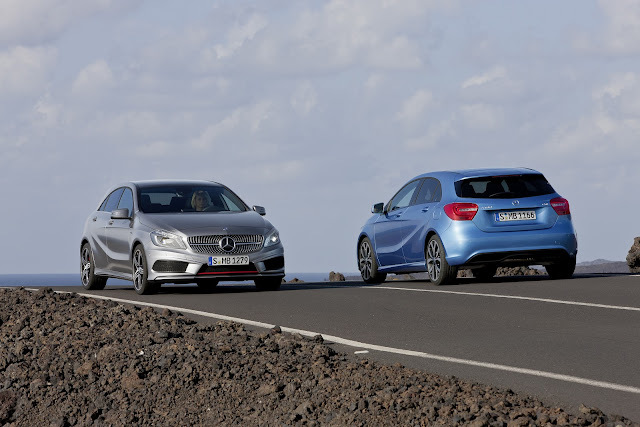 "With the new A-Class, the company is opening up a whole new chapter in the compact segment. The A-Class is the sporty Mercedes among the compact models. It's the right product at the right time - and has tremendous potential to tap into new target groups and markets." "No other car in this segment is as progressive as the A-Class. The almost sculptural lines of the A-Class are very typical for Mercedes. The feature lines, particularly along the sides of the car, give the A-Class structure and tautness. This new dynamic style is also immediately apparent in the interior." "AMG was involved in the development of the A-Class right from the start. That is something very new in the compact segment. You can see evidence of this in the A-Class sports models, which bear the quality seal 'engineered by AMG'. And they live up to that promise, not only with their exceptional looks, but with their equally exceptional driving dynamics." The appearance of the new A-Class reflects the new Mercedes-Benz design strategy. The result is what is known as a two-box design with a distinct character of its own, a sportily emotive exterior and an exceptionally high-quality feel to the interior. Defined edges and tautly drawn surfaces mark out the exterior design of the new A-Class. The constant interplay between concave and convex planes creates a characteristic play of light, particularly along the sides of the car, which contributes to its unique appearance. Typical features of the long, sporty front are its pronounced V-shape, the separate headlamps, the radiator grille with central Mercedes star and double slats to either side of the star, as well as the additional air intakes on the sides. The "dropping line" apparent in the side profile dissipates towards the vehicle's front end. The design of the headlamps, together with the configuration of the light functions within them, is a key element of the design concept. The light modules and LEDs behind the headlamp cover glass have been arranged in such a way as to create the characteristic "flare effect" for the daytime running lamps and indicators. The so-called "flare" is made up of the feature line within the headlamp, the LED modules for the daytime running lamps and the bulb sets for the indicators. This signature effect gives the car its energetic look and so helps to define a new, youthful face for Mercedes. The perfect interplay of dynamic design and excellent aerodynamics is nowhere more apparent than in the roof, with its smooth surfaces and taut, arcing curve. The silhouette reveals smooth, flowing lines finishing in a flat edge. The roof spoiler, which conveniently hides all the aerials, provides an extra sporty touch and gives structure to the roof assembly. The beltline rises to the rear to form a pronounced wedge-shape. The side view is distinguished by sensuously moulded sculptural side panels and distinctive lines. The front structural edge, above the wing, falls in what is known as a "dropping line" in a gentle arc towards the rear. The powerfully shaped shoulder muscles above the rear axle serve to emphasise the car's coupé-like character. A further line sweeps up from just in front of the rear wheel arch, and then gently fades away. All these lines give depth and dynamism to the car's profile. Dynamic side sill panels provide a final finishing touch towards the bottom of the car, enhancing the appearance of elegant light-footedness. The broad emphasis of the tail end is revealed in an interplay of convex-concave surfaces and edges. The tail lights continue the line of the muscular shoulders back towards the rear, while their horizontal orientation emphasises the car's powerful breadth. The light functions are provided by fibre-optic cables and LED modules. Here, too, the interaction between design and aerodynamics is very clear: the surface finish of the tail lights is not only an interesting design feature, but also improves the airflow around the vehicle thanks to defined airflow break-away edges in the rear section. The high-quality feel and sportiness of the car are continued in the interior. Both objectives have been achieved with the help of a specific design idiom and through the various combination options possible with the high-quality materials selected. All trim elements have been given an electroplated finish, resulting in real metal surfaces with "cool touch" effect. The work has been executed with considerable care and attention to detail, so that they appear to have been moulded in one piece. The instrument panel is clearly divided into a wing profile-type upper section and an aesthetically influenced lower section. The resulting effect is that the upper section appears to be supported by a 'muscle'. The manufacturing process used for this 'muscle' allows the creation of varying surface structures with soft tactile qualities. By using special films with three-dimensional structures it is possible to create a range of different surface finishes that permit an attractive play of light. The instrument panel incorporates five round vents, the outer rings of which have a high-quality electroplated finish. The airflow direction is governed by an insert that is reminiscent of an aircraft turbine and reveals a meticulous attention to detail. This too has an electroplated finish in "silver chrome". The free-standing display screen features a black piano-lacquer-look front panel and a flush-fitting silver frame. The instrument cluster comprises two large round instruments, each of them with a small round instrument set within it. When at rest, the dial needles stand at 6 o'clock. The pointer inlays are generally white, although with the sportier design and equipment lines such as Urban and AMG Sport they are in red. The dials on the sporty equipment lines and packages are coloured silver with a chequered flag effect. The 3-spoke steering wheel comes with 12 function buttons and an electroplated bezel. The centre dome and console, as well as the positioning of the various elements such as the head unit, lower control panel, air conditioning operating unit, stowage compartments, rotary push-button and armrest, reflect the findings of the ergonomics experts at Mercedes-Benz. An extensive range of seat coverings, in terms of material (e.g. leather, fabric, Artico/fabric), colour combination and also geometry, provides scope for a broad range of individualisation options. Sports seats with integrated head restraints are available, for example, as an optional extra with all design and equipment lines. The sporty nature of the seats is emphasised by the opening between the upper edge of the seat backrest and the head restraint. On the back of the front seats this opening is edged with a frame in "silver chrome" and, in conjunction with the Light and Sight package, can also feature ambient lighting.